Rather talk to an expert? If you like what you see, our next available agent will give you a call to lock in your best rate! An agent will call you to see if we can lock in the best rates. We recommend that you get at least 3 backup quotes. We need additional information to see if you qualify. An agent will call you shortly to qualify you for our special rate. Prove your health literacy to qualify for additional savings. In case we’re unable to reach you with our first call, please give us a time of day when you tend to be most available. We believe we’ve got you the best rate, but check with others to make sure. This data is encrypted for your privacy. How much coverage are you looking for? What's your individual annual income? How soon are you looking to get life insurance? Do you have an existing life insurance policy? How do you track what you eat during the week? Health IQ Insurance Services - CA License No. OK27284, AR License No. 1800014105. 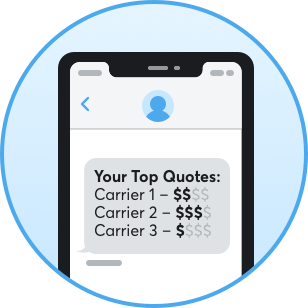 *Estimated rates and savings are non-binding, subject to change, and based on a hypothetical customer profile that may be different than yours. Your specific rate and savings will vary based on individual circumstances, including age, gender, height, weight, health, time of purchase and several other factors. Special rates are available for those who qualify based on health literacy and/or fitness, but not for profession or income. For more information on how we calculate estimated rates and savings, please see our Advertising Disclosures. During the quote process, you may be redirected to our digital life insurance product, Health IQ Express, which does not offer our full range of advertised prices and savings. If you are redirected to Health IQ Express but wish to receive our full range of products, you may call us at (800) 549-1664.